Unlocked and fully user-configurable are the keywords for Eurocom’s Sky X9E Extreme Edition desktop replacement laptop. This machine isn’t called Extreme Edition for nothing. The Nepean, Ont.-based tech firm Eurocom made sure there a lot of goodies baked into its Sky X9E. Open up the rig (no special tools needed), and inside you’ll a BIOS unlocked, 6th generation Intel Core i7 6700K processor, an Intel Z170 chipset and the powerful Nvidia GeForce GTX980 graphics card. 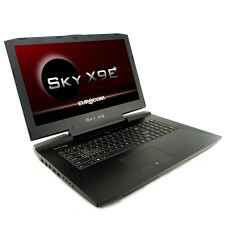 Eurocom unleashes the Sky X9E Extreme Edition laptop. This desktop replacement laptop from Canadian computer maker Eurocom, is not called Extreme Edition for nothing. The 17” Sky X9E is powered by an unlocked Intel Core i7 6700K processor and Nvidia’s powerful GeForce GTX 980 (desktop edition) graphics card. The Sky X9E has 64GB of RAM, and offers 1TB of storage which is upgradable to 5TB. It is completely user-upgradable and fully customizable to suit every need from awesome gaming machine to high-performance computing workstation.